The airport is less crowded then. The planes are never full. If there is a flight delay or cancellation you will have maximum rescheduling options. You get where you’re going early enough to get a lot of work done, which at least justifies the cost of the hotel room that night. And only one negative: You have to wake up at 3 AM to get to the airport on time. But I always do, and so at this point I’m used to those earrrrrrrrrrly mornings, and the ~20-hour work days that follow. Though of course it’s hard to imagine this is really work when I would probably be doing it anyway even if I wasn’t a dealer. At least that’s what I was thinking as I arrived at the elegant Schaumburg Renaissance Hotel and Convention Center (considerably more elegant than the buildings all around it) at about 9:30 AM, bursting through the sets of sliding glass doors and diving right into the day. Starting in my room, where I got everything organized, collated, stacked and ready for action before heading down to get the attached convention center to get my show badge and then parking myself in the Heritage lot viewing room. Which was pretty much jam-packed when I got there, resulting in loooong delays for the lots I wanted to see and a generally unsatisfying viewing experience for your author who as we know from every previous RR really, really likes to motor through these things at 100 MPH. But I’d eventually see them all during a couple hours of viewing interrupted by lunch, a number of extra-super good phone orders for coins on the site and a quick foray to another dealer’s hotel room to look at three coins being offered which we then bought in no time flat. After which I went back to my own room to update the site, call two customers and then eventually migrate my way to dinner with a couple of dealer friends at the hotel restaurant where we figure to be eating nearly every meal over the next few days since we are sort of captive here, and there aren’t any terribly exciting options in the vicinity. I guess if you thought it was really important you could drive into Chicago, which some of the other dealers will do, but which I just don’t find necessary. So while those guys are out partying on Rush Street, your author will be typing this blog and prepping for what will be a looooong Wednesday, starting with a 7 AM marketing meeting here at the hotel before rolling into dealer set-up at 9, working all day on the bourse floor, buying and selling like crazy, submitting all of our grading and then bidding in the Heritage first session starting at 6 PM. The results of which will be described right here just 24 hours from now. After an interesting meeting over breakfast with our friends from CoinWorld, it was time to join the throng assembled in the hall outside the bourse room waiting for the ceremonial flinging open of the doors. And when they did (and ONLY when they did) was an announcement made that you needed to have a red sticker on your badge to enter, which of course my able booth assistant and nephew Sam did not have (since of course no one had ever mentioned that frickin’ sticker to him or me before that moment). Which was sort of a problem, since by then there were, oh, a hundred people on line at the registration counter all positioned to derail our plan to jointly set up the booth at numismatic light speed. Alas, simply shouting “I NEED A RED STICKER” worked perfectly to avoid the line, we were back on track and not 15 minutes later we were set up and ready for action at Table #703. Giving your author his much desired opportunity to power walk around the floor and start looking for cool coins as the rest of the dealer community was just getting unpacked (or possibly out in the queue waiting for their own stickers). But even in that environment, and without much to choose from, we always seem to find a few interesting things, which in this case would include a lovely toned mid-grade half dollar and some old-holdered type all in the category of what we call ‘finished goods’ (i.e. coins that are ready to be sold right now, as opposed to something we’d need to grade, regrade, reholder, send to CAC, etc.). One of the other benefits of walking the floor is the information you pick up, as coins get offered to others, deals are in process, you find out about collections coming up, and you hear that occasional and always welcome ‘Hey, I have something you might want’, in this instance spoken by another dealer who was also walking around and serendipitously stopped to peer into the same case I was looking at. And while that doesn’t always lead to business, sometimes it turns out to be epic. I’ll have to let you know which one this is tomorrow, though, since those coins will not be here and available to view until Thursday morning. Despite the fact that this entire day was devoted to dealer set-up and the limited number of collectors willing to pay the “professional preview’ fee to enter, traffic at the table was good and steady, sales relatively robust and focused entirely on more expensive items. That’s very unusual in our experience, except at this show since we observed the exact same phenomenon here back in 2014 as described in our Road Report back then (specifically the April 24th: Day 3 installment). As then, I have no idea why this would be the case, but we’re committed to going with the flow whatever that flow happens to be. With our late day efforts focused on the evening’s Heritage auction, where we entered a bunch of bids and won everything we wanted before heading to dinner yet again at the hotel where we are slowly progressing through every single thing on that menu. After which we called it an early night in anticipation of a Thursday which should be exciting, as we welcome the actual public for the time, continue our search for NEWPs, pick up Wednesday’s auction winnings, and bid on more coins at HA throughout the day and into the evening's celebrated Platinum Night session. With everything that happens there described right here on Friday AM. Remember that ‘Hey, I have something you might want’ guy from yesterday? Well I did, so I got to the show at precisely 9 AM as the doors opened for booth holders so I could be ready to swoop in as soon as the coins were available. That proved to be a real good plan, since I was on them within minutes and found some cool new stuff to buy that might not have been there even 30 minutes later. And then peered into most every other case in the room (or at least the ones that were not still shrouded in case covers and upside down chairs at that point), finding a few more coins to add here and there. Also seeing other coins that I liked and wanted to buy, but which were just too expensive, including several that I have seen for y-e-a-r-s now at the same dealers' tables and which have become like old family friends. Still, if I could get them for more reasonable numbers I am positive those would be very popular on the CRO list, so I will keep asking to see them and verifying the prices at every future show until 1) The owners finally cave in and accept my offers, or 2) The market eventually rises up to meet their current asks, which I predict will happen in the summer of 2024. After which I was back at the table to meet a steady stream of visitors, including many long time Midwestern customers, a few who made the trip from great distances and one collector friend who had taken a loooong numismatic hiatus and last visited the CRO table some 5 years ago. That was nice. With all either buying coins or offering me others on a day that turned out to be pretty robust commercially, with some cool new purchases and sales of all kinds and at all price points, including colonial, US and world issues, some we’ve had for a little while, others which never even made it to the website. But a few über-desirable coins that were offered to me got away too, where I made offers that were close and seemed like they might work, but which the owners decided to keep. I can only hope that sometime down the line a few of those may come back to me. What did come back to me at that point were some pretty good grades, including on a number of coins submitted on behalf of customers, all of whom were delighted with their results at a show in which I did not hear too many other positive reports about grading. Of course, it matters greatly (actually entirely) what you send in. And then suddenly it was 5:45 and time to get ready for the Heritage Platinum Night Auction in which we targeted two coins, bought one and then quickly headed out for dinner at some Sushi restaurant a half hour away with relatives, which was a delightful and most welcome change of pace. From which I returned just in time to look in on the HA auction (which was of course still going), very nearly buy a cool gold coin but ultimately decide to let it go, which might have been a mistake, but I don’t think so. What I do think is that Friday figures to be another pretty good day overall, as we continue our efforts to buy and sell cool coins of all types at table #703. While it now seems like we’ve been here for several weeks, there was no loss on energy in the room on Friday as we continued to buy and sell at a surprisingly good clip. As I motored around the room finding things we had to have in obscure places, but also in the wholesale boxes of major dealers that were not there the first time I looked on Wednesday. Which is an important point for all of those considering a career in numismatic bourse floor scouring. Namely that you can’t just do it once and pronounce the job complete. Oh no. You see, the situation is constantly changing, new coins are walking into the room, or moving from the secrecy of back tables into the bright lights of the display cases, or making their way into wholesale boxes, or possibly coming back from grading where they are all of a sudden available to some guy casually strolling by, like your author, for example. Who then needs to be ready to act fast and snag them before the next scourer comes strolling down the aisle minutes later. And after nearly every one of those forays around the room, I’d come back to the CRO table to find someone there – be it a collector or a dealer - looking at some coin or other with my nephew, suddenly whipping out a checkbook and pronouncing it a done deal. With all of that action generating a now giant pile of paperwork in our back case, exceeded in volume only by the pile of aforementioned new coins. Including even more world issues despite the fact that I told myself to take it easy in that area as we have so many such NEWPs from recent shows. But when you find great things priced right, hey, you really have no choice but to ignore your earlier self and just buy them. So I did. They were still dwarfed, however, by our haul of US coins here. And of course we aren’t done yet, with a full Saturday yet to come here in Schaumburg where I will shocked if we DON’T buy and sell more coins. With all of our results then described here in our exciting conclusion on Sunday AM. 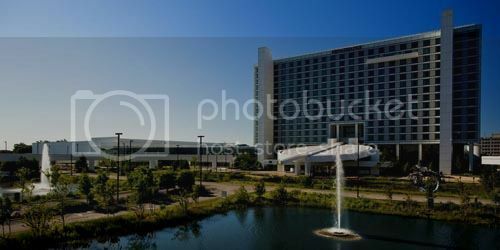 Thumbs Up: The show hotel itself in Schaumburg was really superb, first class, comfortable and among the nicest we stay at during the numismatic year. Thumbs Down: Not that crazy about the TV set embedded in my bathroom mirror which automatically switched on when you entered the room. I was even less crazy about the fact that it did not automatically turn off when you leave, since that required your author to then go back in and turn it off where (and I think you may have seen this one coming) it immediately turned itself back on in a continuing and very frustrating cycle which could have caused a less patient numismatist to destroy it with the ironing board. Thumbs Up: We bought 46 coins here (exactly one more than at CICF two weeks ago), including a deluxe mint state Seated Dollar late Saturday afternoon, and a fantastic Hard Times token even later. Thumbs Down: Never could make a deal for the lovely toned MS64 old-holdered Walker we wanted, as the seller was stuck on 66+ money. Thumbs Up: Sales were good from the start of dealer set up straight through Saturday afternoon when we sold that 1893 Proof Barber Half just before packing up. Thumbs Down: I though we might sell one more coin just after, but the collector interested wanted to trade in a coin toward it that I just did not like and valued only at the low price it would inevitably bring when we consigned it to an internet auction. This is sort of the equivalent of telling someone their baby is ugly, except that they take it more personally when numismatics are involved. Thumbs Up: We bought some cool coins in the auction, including one we lost and then ended up winning anyway (call me if you want me to explain that one – it would take too long to type). Thumbs Down: Our coin yield vs. time spent viewing, planning and bidding just isn’t very good, and may cause us to rethink our whole approach to auctions going forward. Thumbs Up: We got some good grades here at this show, including on customer coins that really deserved it. Thumbs Down: I was also shown mega-score results from several other dealers, including a couple of coins I never, ever (e-v-e-r) would have expected to grade that high. Thumbs Up: Discussions with two different collectors at the table on different days revealed that they might consider selling collections, and now I am reasonably confident we are going to be able to buy both in the next couple of weeks. Thumbs Down: We never could make a deal with one collector with whom we’ve had many near misses through the years despite our best efforts and above market offers. Which I think may be some sort of cosmic signal for us not to try in the future. Thumbs Up: My nephew Sam was a huge help behind the table and has now been added to the CRO go-to list of show helpers to call as we traverse the country. Thumbs Down: All of them are probably going to be in school or working this summer, leaving us in the lurch for the August ANA in Anaheim. Thumbs Up: We had lots of NEWPs photographed at the show in preparation for the next Early Bird. Thumbs Down: There were 8 boxes of coins back from grading, CAC, recent purchases, etc. waiting for me when I got home, none of which are imaged, and so I’m not sure yet if we will do the EB this coming Tuesday, or the one after that. We’ll make that decision ASAP and post the schedule on the homepage just as soon as we know it. But first it's time for a little R&R which frankly we think we've earned after a month+ stretch which included four shows worth of flying, schlepping, viewing, hauling, sorting, bidding, buying, selling, trading and grading.